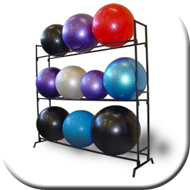 The Ball Racks are Made in Australia from high quality steel and are powder coated. The Ball Trees are Made in New Zealand from steel and are chromed. The rings offer Polycarbonate (stronger and more durable) or PVC options.